Kitchen 2404 closed back in July. 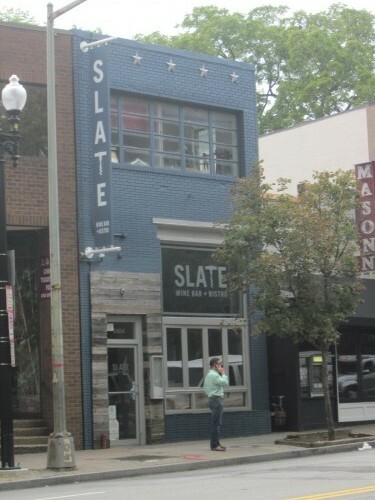 Glover Park officially becomes home to Slate Wine Bar + Bistro today at 4 pm when the highly-anticipated new restaurant opens its doors to welcome friends and neighbors looking to share some of the best quality food and wine around. For non-wine lovers, Slate has a great selection of cocktails and craft beers. The wines complement the bistro menu created by Journeyman Chef and General Manager Mark Krieger. The menu features everything from light snacks to cheese plates, heartier fare including a wide selection of unique salads, panini and the Clean Slate burger, and entrees including steak frites and salmon. Desserts are hand-made by Lester DC’s “Pie King” in Slate’s kitchen. Menu items focus on using the best possible ingredients and simple preparations that showcase the ingredients. The menu will change seasonally and will be supplemented by daily and weekly specials from the freshest local ingredients. Slate will offer daily wine features, flights, and pairing advice. Slate will also host a wide-range of educational and entertaining wine events, including winemaker dinners, tasting seminars, wine clubs, escorted trips to wine regions, and more. Slate’s first wine dinner is September 11, 2012, featuring Copain Winery from California. Details and information on other upcoming events will be posted on the website at www.slatewinebar.com.